Three outdoor acrylic courts in Florida, USA have been awarded Two-Star ITF Recognition. 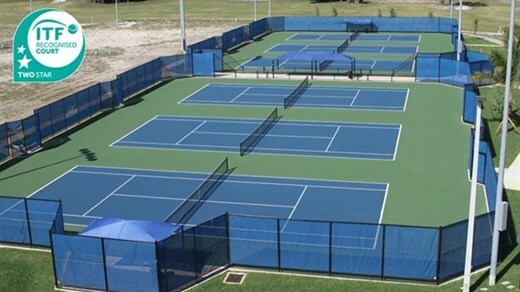 Two courts at Palm Beach Atlantic University were tested against the ITF recommendations for evenness, slope, planarity, dimensions and court pace rating, and gained Two-Star ITF Recognition which is an acknowledgement of high-quality installation. The DecoColor Cat 3 surface was supplied by California Sports Surfaces®, a company well-established in the court surface industry and a long-standing member of the ITF Foundation. The courts were installed by ProCourts in conjunction with Global Sports & Tennis Design Group design team. One court at Fisher Island Racquet Club also obtained Two-Star ITF Recognition using DecoTurf® Select, supplied by California Sports Surfaces®. This court was installed by Agile Tennis Courts. With five laboratories accredited to conduct Two-Star ITF Recognition testing worldwide and three approved One-Star assessors, the programme is set to expand further in 2015. For more information about the ITF Recognition programme, visit www.itftennis.com/technical/courts/recognised-courts or email the ITF Technical Centre at technical@itftennis.com. This entry was posted in California Sports Surfaces, DecoTurf®. Bookmark the permalink.